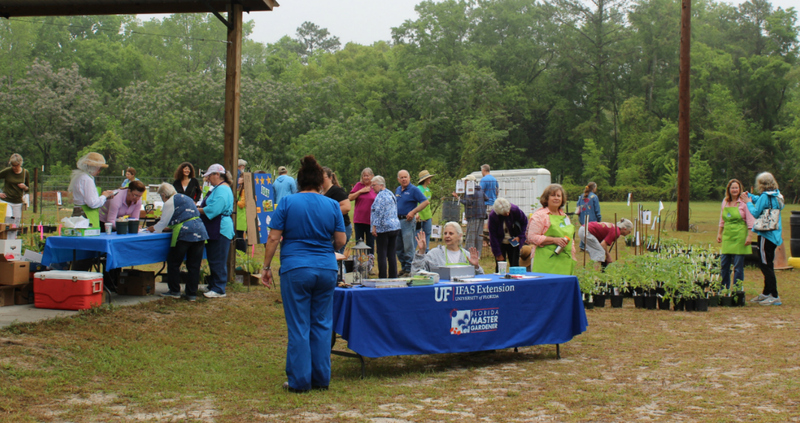 Saturday, April 6, 2019, we hosted our 5th annual Spring Plant Sale. Planning for our group began last fall, with many of us dividing perennials, planting seeds, and rooting cuttings during the winter months. The winter months also saw lots of maintenance on the Extension grounds and demonstration gardens! We ended up with over 70 different plants in these five categories: house/porch plants, herbs, vegetables, trees, and ornamentals. 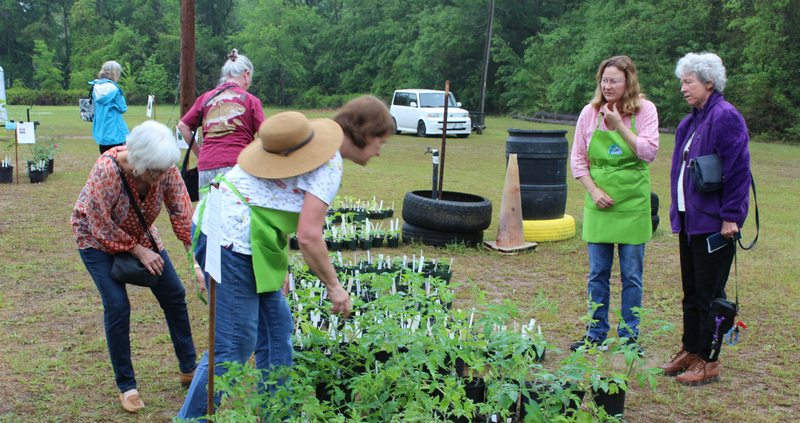 We moved approximately 700 plants to the sales area on Friday afternoon, dodging raindrops! Saturday morning started warm and muggy! Later the fog turned to a high overcast that helped keep the temperatures mild. Plant enthusiasts showed up before 9 am, ready to find the perfect specimen(s) when the gates opened! Attendance was better than expected with several other local events happening the same day. 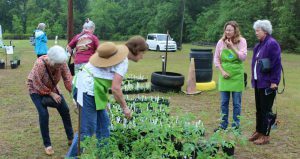 We had two classes for the public: How to Pull a Soil Sample for a Soil Test (taught by JoAnn Green, Master Gardener Volunteer) and How to Propagate Plants from Hardwood Cuttings (taught by Les Harrison, County Extension Director). Both classes included audience participation and practice. For the Soil Test class, participants received a kit to mail off their soil specimens and practiced digging for a sample and filling the test bag. For the Propagation class, participants were able to select 3-4 cuttings of either azalea, blueberry, crepe myrtle, gardenia, and oak-leaf hydrangea and place them in a pot of growing medium to take home. Iris Garden Club joined us and set up a booth with plants their members propagated for the sale. We shared our list of plants with the garden club, so they were able to offer a different selection to the public. Our plant sale also included an area where customers could purchase wildflower seeds, ordered and packaged by our own Dan Dobbins, the ‘Wildflower Man’! Our Master Gardeners “Thank You” For Your Support! This was a record year for us, both in attendance and in proceeds. We could not do this without support from the Wakulla County Extension Office and staff! And our thanks to local residents and visitors for taking time to attend the plant sale.